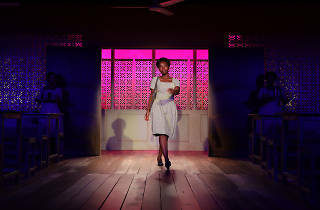 After a sold-out run last year, Jocylen Bioh's play returns for an encore engagement, with most of its original cast. Joanna A. Jones, Latoya Edwards and Zenzi Williams are the new girls. As a performer, Jocelyn Bioh has perfect and relentless comic timing: While you're struggling to your feet after one joke, she'll cut another actor some side-eye and down you go again, laughing helplessly. 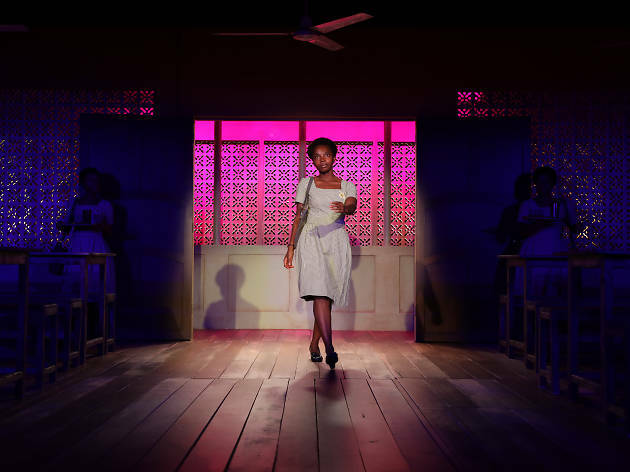 Bioh's also a playwright, and her first New York production, School Girls; or, The African Mean Girls Play, has that same nearly assaultive hilarity. You can hear echoes of Bioh's rhythms—the little tsk-ing noises she made in An Octoroon, her bossy-boots quality from In the Blood—in the dialogue she writes. School Girls is therefore a kind of Bioh bonanza; after several seasons of settling for just one of her, there are suddenly eight. It's a crucial week at Aburi Girls Boarding School. A recruiter for the Miss Ghana 1986 competition is coming to choose that year's lucky contestant, and the school's queen bee, Paulina (MaameYaa Boafo), intimidates friend Ama (Nike Kadri) and the rest of her clique into supporting her; even the headmistress (Myra Lucretia Taylor) assumes that Paulina's the natural choice. Tweedledee and Tweedledum cousins Gifty (Paige Gilbert) and Mercy (Mirirai Sithole) assure Paulina that she looks “fine-fine all the time," and back her blithe nastiness to their friend Nana (Abena Mensah-Bonsu). But the arrival of a sunny American student, Ericka (Nabiyah Be), may be the nudge they need to free themselves. Abruptly, Paulina's lordly pronouncements lose their weight, and pageant recruiter Eloise (Zainab Jah, doing her best Dynasty villain) has eyes only for Ericka's relatively light skin. You can almost hear the gears shriek as Bioh's play veers from a comeuppance comedy into a wrenching drama about colorism. Her brief play is missing its middle; one minute we're baying for Paulina's blood, but when she actually sheds it—her cheek blistered by lightening cream—we're hastily asked to see her as a complicated, flawed character. Director Rebecca Taichman leans so far into the bright Punch-and-Judy colors of the first 50 minutes that the last, humanistic 20 seem to take place on a different planet. Still, Bioh knows how to write a stunning breakdown scene, and Boafo handles the tonal switcheroo with ease. Her incandescence into fury and self-hatred seems to cast an actual light, and it burns itself quick-quick onto your retinas. Lucille Lortel Theatre (Off Broadway). By Jocelyn Bioh. Directed by Rebecca Taichman. With ensemble cast. Running time: 1hr 10mins. No intermission. Through December 10.